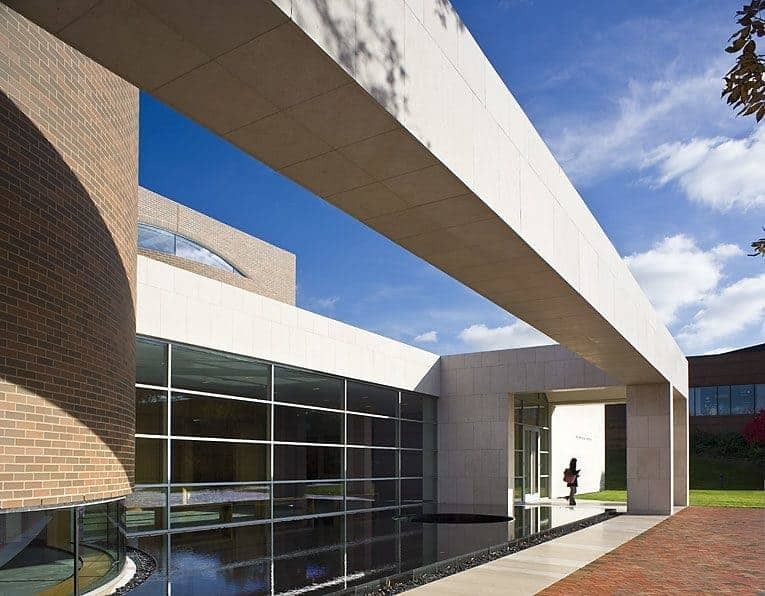 Visitors enter the building through a portico adjacent to a reflecting pool and arrive in the main lobby and prefunction space. Both of the centers are classic rotunda forms. 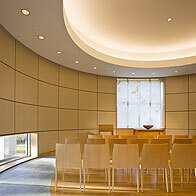 The larger Main Center seats approximately 250 people, with the smaller Meditation Center seating 40. While most of the building’s exterior is clad in limestone, the centers’ exterior walls are clad in brick, helping to articulate the spaces. The Main Center is 30-feet-tall, its circular form extending above the building’s 16-foot-high roofline. The wood paneled seating space opens onto a rectangular sanctuary with a raised wood platform with a backdrop of a ceiling-to-floor water wall. Its large, curved entry pocket doors open onto the foyer, allowing the center to accommodate larger crowds for special holy day services and other occasions. 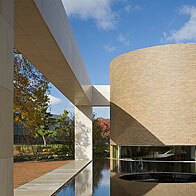 Throughout the facility, there is the contrast of curvilinear, rectangular and square forms. 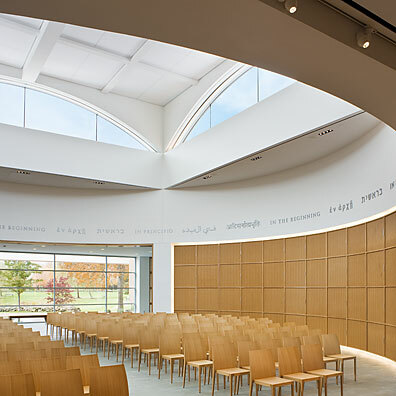 A square monitor roof tops the larger rotunda, with curved windows on each of its four sides bringing light into the space. An open porch to one side of the Main Center extends onto a terrace, creating a quiet outdoor campus room.